Got an extra $70K laying around? If so, you might want to consider picking up Sony’s forthcoming 98-inch Master Series 8K LCD TV that will be coming soon to AV specialty store near you. Thanks to industry sources, HD Guru has received expected initial Unilateral Pricing Policy (UPP) prices for Sony’s much-anticipated 2019 Master Series TVs, which dazzled attendees in Las Vegas last January at CES 2019. As you might remember, Sony made a big splash at the big tech convention by unveiling its latest Bravia Master Series televisions that include the A9G Series with the company’s first 8K full-array LED LCD TVs, and the A9G series with Sony’s new and improved 2019 4K OLED TV offerings. The Sony 2019 Z9G 8K LED-LCD TV line consists of two very large screen models in the 85- and 98-inch screen sizes. The 2019 A9G 4K OLED TVs are to be offered in three screen sizes including 55-, 65- and 77-inches. As stated, the grand-daddy of the 2019 offerings is the 98-inch XBR98Z9G which rings in at a $69,999.99 UPP. The 85-inch XBR85Z9G sister model will be available for $12,999.99, according to HD Guru sources. 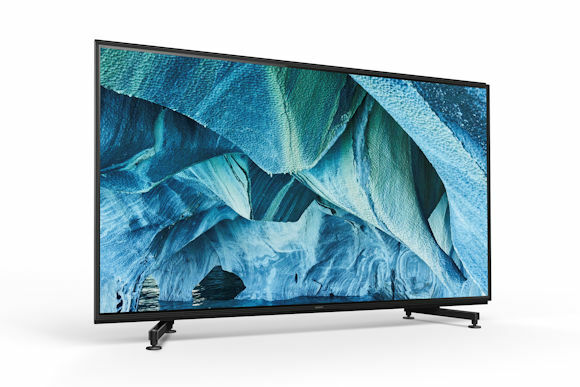 As for the newest 4K OLED models in the A9G series, the 55-inch XBR55A9G will hit the street at $2,799.99. The 65-inch XBR65A9G will get a $3,799.99 UPP and the 77-inch XBR77A9G will see an initial price tag of $7,999.99. Pre-orders on select models will begin on May 24, 2019. All pricing were supplied by sources outside of Sony and are subject to change before they hit retail shelves. All Master Series TVs feature a smart TV platform based on the Android TV OS, and include Sony’s top-end X1 Ultimate processing chip to drive the sets’ advanced picture and sound-enhancing technologies. Additionally, all Sony Master Series models Netflix Calibrated Mode and IMAX Enhanced certification to further ensure that content is delivered as its creators intended. As with the 2018 line, advanced videophiles and professional calibrators will find this year’s Master Series models also conform to a CalMan AutoCal workflow that was specially developed for the lines by Portrait Displays/SpectraCal. The new 8K Master Series models will leverage the “X1 Ultimate” picture processor to produce exceptional upconversion with accurate detail and contrast. Further, Sony said it has developed a proprietary algorithm that optimizes the X1 Ultimate to handle the 33 million pixels of 8K. The same processor also drives the newly developed 8K X-Reality PRO upscaling engine that transforms lower-resolution content into near-8K picture quality. The system uses a dedicated 8K server database to adjust SD, HD and Full HD images to even more precise levels of detail and clarity. Other new systems developed for 8K include Backlight Master Drive with full-array local dimming. The Backlight Master Drive on the Z9G has ultra-dense LED modules that are independently controlled, delivering high contrast levels with punchy brightness and deep blacks. In the process, 8K X-tended Dynamic Range PRO uses the saved energy to intelligently boost the brightness in the areas where it needs to be boosted. In addition the sets feature, 8K contrast technology that unlocks details in shadow and highlights. This is said to produce up to 20 times the contrast of conventional LED TVs. Combining 8K HDR TV technology with 8K X-tended Dynamic Range PRO ensures dark scenes are darker and bright scenes brighter, according to Sony. This helps shapes and textures appear in shadows and bright highlights. By balancing the light output across the screen, dimming LEDs independently and boosting others, X-tended Dynamic Range PRO reveals a brightness range several times that of a conventional LED-backlit TV, Sony said. An Object-based HDR Remaster system boosts color in individual objects on screen by analyzing the adjusted contrast instead of only adjusting along one black-to-white contrast curve. Because objects are remastered individually, this TV can reproduce greater depth, textures, and more realistic pictures, Sony said. A Super Bit Mapping HDR system helps reveal thousands of tones, shades, and gradations of light. Super Bit Mapping HDR is said to create smooth, natural TV picture quality without the “banding” that can occur on other TVs. The system leverages a noise reduction database of before and after images to identify compressed noise and remove it for the most realistic results. Similarly, an upscaling database uses “before and after” data to upscale the signal and create a more realistic picture. Sony Home Entertainment Systems product technology manager Rob Brennan accepts the 2019 HD Guru Best 4K OLED TV of CES 2019 for the 77A9G 4K OLED TV from Gary Merson. Sony’s 2019 A9G 4K OLED TVs are distinguished by a new cosmetic design that significantly reduces the angle of tilt to the OLED panel in table-mount configuration. The 4K OLED models utilize the X1 Ultimate processor that pairs the deep black and natural color of OLED with Sony’s Pixel Contrast Booster for enhanced color contrast in high luminance. The 2019 Sony 4K OLEDs also include the built-in Acoustic Surface Audio+ system that leverages the thin OLED panel as stereo speaker with sound emitted directly from the picture. Alternatively, the system can be connected to a AV receiver to use the internal sound system as a center speaker that produces clear dialog, vocals and instruments.